Get The Swing Gate You Always Wanted! If you've been debating about having a swinging gate installed, but were unsure about the cost, it's time to stop worrying! We offer affordable, quality installation with the best tools and materials. Our technicians can help you decide on what look is right for your home, be it wood, metal, or otherwise, and will get it installed fast so that you can get in and out of your home without issue. It's bound to spruce up the look of your home and is an added layer of security as well! With constant daily use of your gate, the various parts of it are undoubtedly going to get worn down over time. Rust is also a factor thanks to the elements, and it can cause your door to be more difficult to open and make noise as it does. Don't worry! We'll get to the bottom of whatever is causing the trouble and take care of it for you. If it's the hinges, we'll either perform welding repairs, or replace them entirely if needed. If you have an opener system, we can tend to it as well! Our experts are knowledgeable in a vast array of manufacturers as well, so whatever you have, we can fix it! Anything from a bad storm to an accidental bump from a car can knock your gate out of place and make it so the door isn't closing correctly. This not only creates a security risk, but it can lead to further damage over time. We can carefully go over everything to get it back to its proper position for you! No matter if your business already has a swing gate that could use some repairs, or if you'd like to have one installed, our professionals would be happy to assist you! We'll get the work done quickly and thoroughly. 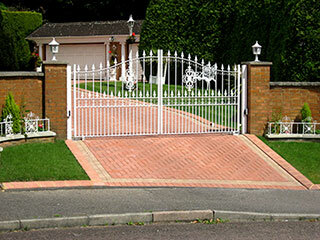 Call Gate Repair Los Angeles now and let us assist you!